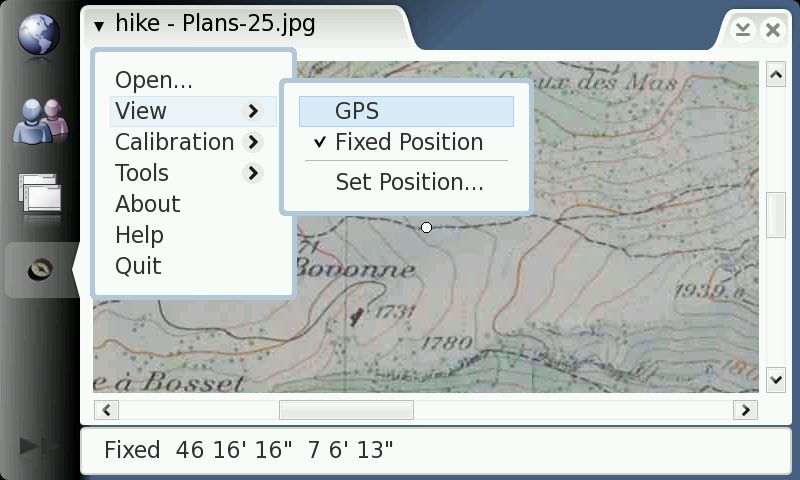 Hike is an open-source GPS Maemo application for Nokia N800/N810 internet tablet. Its purpose is to display the picture of a paper map and your GPS position on top of it. It's a useful alternative to more ambitious navigation GPS applications where good digital maps aren't readily available, such as hiking paths or exotic places. The picture of the map is obtained typically with a digital camera. Choose a large focal length and have the map perpendicular to the view direction, so that parallel lines on the map remain parallel on its picture. Choose a low JPEG quality to have a file not too large (a few hundred kilobytes are fine, more could force you to quit other applications). Rotations and scale discrepancies along x and y axis are taken care of. The position mapping from GPS (latitude/longitude) to picture is based on at least two "calibration points". If you know the latitude and longitude of points which can be specified on the map picture, you can enter them numerically in decimal degrees or degree/minute/second; otherwise, you can use your GPS position as you walk. Calibration points should define an area as broad as possible. 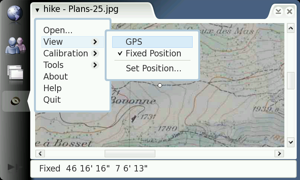 This snapshot was created in the development scratchbox where GPS isn't available. GPS provides also the altitude. Click the image to have a larger screenshot. If you read this page on your internet tablet, click this link to install the latest version of Hike. Otherwise, you can download a .deb file below and open it on your tablet.